However, funding continues to be a nonprofit’s greatest challenge. In this era of funding uncertainty, should an organization take all the funding it can get or are there times when “No Thank You” is the best answer to a funding opportunity? • Larger foundations are rethinking funding strategies, taking on programmatic initiatives and giving to fewer organizazations. Funding is not going away. There has been a major shift in funder expectations, though, as donors are becoming more sophisticated and no longer give just for the sake of giving. Funders are focused on programmatic outcomes as the major criteria to measure mission effectiveness and an organization’s success. Funders are taking a data-driven approach and making funding available to organizations where leaders can prove desired outcomes. Many organizations struggle with how to measure success and mission impact. There continues to be a lack of funding for administrative overhead and infrastructure, despite the noble efforts to “dispel” the overhead myth. Some organizations have been successful in enticing a core group of donors to focus support on infrastructure. It remains difficult to find funding for non-programmatic activities. The mentality that organizations investing in infrastructure are taking resources away from program still exists. Many funders continue to cap overhead reimbursements below true cost to execute program. In addition, nonprofits are constantly being bombarded by unfunded mandates. The increase in minimum wage and paid family leave provision are recent examples of such mandates. While the merits of these programmatic initiatives are not being debated, there are staff, legal, and information technology costs associated with implementing these directives but no funding. The nature of funding is also a challenge, as restricted funding with complicated and onerous reporting requirements is more common than unrestricted funding. Funding diversification is a risk for many nonprofit due to reliance on one or a few funding sources. Funding strategies should be developed to help manage these funding challenges. All funding opportunities should be carefully evaluated prior to acceptance. Organizational leaders need to ensure that the funding is in line with its core mission and assess the impact the funding will have on its bottom line and cash needs. Funding should cover a portion of administrative costs. All funding is not equal. Funding strategies should emphasize the importance of unrestricted funding. Funding diversification is critical to an organization’s financial sustainability as funding diversification ensures that an organization is not overly dependent on a sole funding source. Other important items to focus on prior to funding acceptance include the impact on staffing levels, use of facilities, and start-up costs for new programs. In-house expertise to effectively manage the new program might also be required. The funder might mandate matching funds. It is imperative that managers determine if matching funds are available. If the funding is a one-time commitment, organizational managers should identify other funding sources to keep the initiative operating in the future. The managers need to assess whether there are adequate systems in place to collect the required programmatic and financial data. In addition, managers must assess if there are onerous reporting or compliance requirements associated with the funding. All nonprofits should have a gift acceptance policy regardless of size and complexity as part of the funding strategy. A well designed gift acceptance policy can help To ensure that funding is appropriate and furthers an organization’s mission. An effective gift acceptance policy should provide guidelines to assist leaders to evaluate the risk (including reputational risk), costs and benefits associated with proposed funding prior to acceptance. There is still the mindset that some funding is better than no funding. Some managers refuse to reject funding even when it does not support the organizationʼs core mission and cover administrative overhead. One of the most important attributes of a gift acceptance policy is that it makes it easier to manage donor expectations and helps to preserve the donor’s relationships when gifts are rejected. It is much easier to say “no” to funding with the support of a policy. A sound gift acceptance policy serves as guidance for board members who are either on the asking or receiving end. It also depersonalizes the gift acceptance process for staff. Staff on the frontline might be approached about a unique gift and be put in an awkward situation. A gift acceptance policy allows them to explain that the organization will not automatically accept the gift. Implementing a gift acceptance policy is considered good governance and promotes operational efficiencies. Internal Revenue Service (IRS) Form 990 asks whether a nonprofit has a gift acceptance policy. And while the IRS has explicitly stated that the adoption of policies and procedures asked about in the Form 990 is not mandatory, the IRS clearly attaches some significance to the manner in which nonprofits are governed. 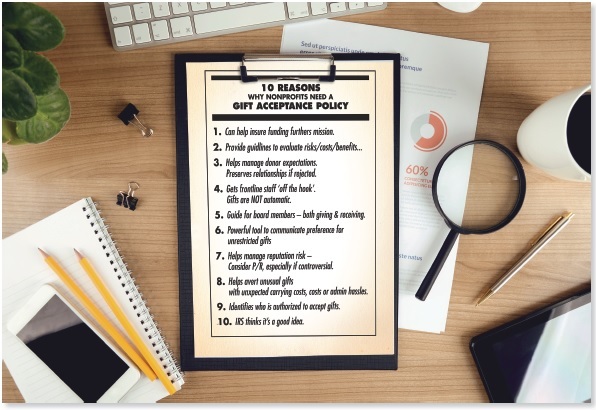 Gift acceptance policies serve as a powerful tool to communicate to prospective funders the organization’s preference for unrestricted gifts and the need for overhead. A gift acceptance policy clearly outlines the type and form of funding that will be readily accepted or might be accepted after further review. It also helps an organization manage reputational risk by clearly stating that an organization should consider the public relations ramifications of accepting gifts that are controversial in nature or from a controversial source. A well-crafted gift acceptance policy might avert the receipt of an unusual gift with unexpected carrying costs or burdensome administrative obligations. A useful gift acceptance policy also identifies who is authorized to accept gifts on behalf of the organization. An effective gift acceptance policy acknowledges that every organization is different and gifts differ in value and impact from one nonprofit to the next. There is still the mindset that some funding is better than no funding. Some managers refuse to reject funding even when it does not support the organization’s core mission and cover administrative overhead. There are instances when funding should be refused. Strategies and policies on when to accept new funding should be developed. An organization-wide commitment to adhere to these policies should be made. In these times of unpredictability, a carefully- constructed funding strategy, the thorough evaluation of funding opportunities prior to acceptance, and the implementation of an effective gift acceptance policy should allow managers to confidently say “no” to certain funding offers. Amy West is chief financial officer at AHRC New York City. Her email is amy.west@ahrcnyc.org.